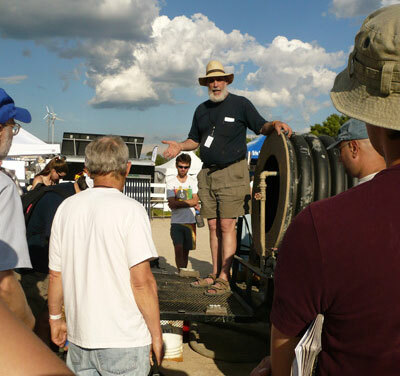 Design Coalition regularly participates in the MREA's (Midwest Renewable Energy Association) Annual Sustainable Living and Renewable Energy Fair in Custer, Wisonsin. At past MREA fairs we've helped present live demonstrations of natural construction techniques. These techniques are described in more detail in our web sections on the Affordable Natural House. Video of Douglas Piltingsrud's 2011 talk at the Energy Fair, courtesy of JATVMedia. Video of Lou's 2011 talk at the Energy Fair, courtesy of JATVMedia. We also present regularly at the IREA (Illinois Renewable Energy Association) fair, speaking about proven alternative techniques for sustainable home construction for the Midwestern climate, with examples of built homes that are energy-efficient and low-toxin, which use straw-clay, stabilized earthen plaster, adobe floors and other low-impact materials and methods. As always, we had physical examples of the materials, and provide handouts on various topics.